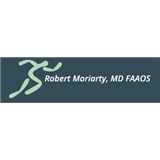 Robert Moriarty MD P.C. (Huntington) - Book Appointment Online! The Huntington, NY office of ROBERT V. MORIARTY, MD, offers you a professional, caring staff; personalized care and extensive experience in orthopedic medicine. Orthopedics is a specific area of medicine, dealing with illnesses and injuries of the musculoskeletal system of bones, joints, muscles, tendons, and nerves. Our specialty in this area enables us to diagnose and treat athletic injuries, work injuries, fractures, arthritis, and many other orthopedic conditions.